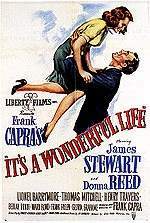 One of the most popular American films of all-time and a perennial holiday favorite, IT'S A WONDERFUL LIFE was not a huge hit with either critics or audiences when it debuted in December 1946 (see articles) but was nominated for five Academy Awards including Best Picture, Best Actor (Jimmy Stewart), and Best Director (Frank Capra). After slipping quickly into obscurity, it began appearing on television occasionally in the late 1950s. But when the film's copyright lapsed in 1973, IT'S A WONDERFUL LIFE quickly became a staple of American TV programming between Thanksgiving and Christmas and belatedly earned its rightful place in the lexicon of American popular culture. 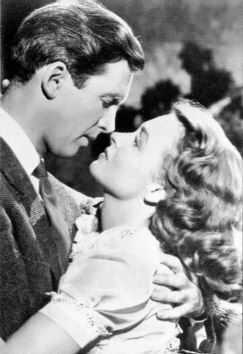 Ranked #11 on the American Film Institute's list of Greatest Films, IT'S A WONDERFUL LIFE is an indisputable movie classic. 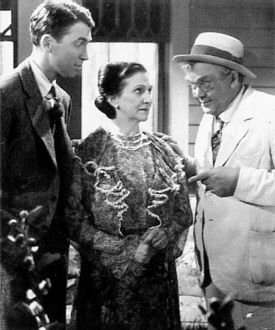 Jimmy Stewart, Beulah Bondi, and Thomas Mitchell, three co-stars of Capra's pre-war drama MR. SMITH GOES TO WASHINGTON (1939), are reunited on the Bailey's front porch in IT'S A WONDERFUL LIFE. For Bondi, the film marked her fifth and final production with Stewart and the fourth film in which she played his mother. "Where's my hat? Where's my ... Oh, thank you, George. Which one is mine?" --Uncle Billy. 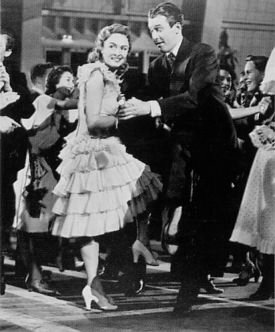 George Bailey (Stewart) and Mary Hatch (Donna Reed) doing the Charleston at the high school dance -- a scene filmed in the Beverly Hills High School gymnasium. For Reed, an up-and-coming starlet under contract to MGM, after having appeared in some 20 films, IT'S A WONDERFUL LIFE proved to be the big break in her movie career. "Buffalo Gals" sung by Jimmy Stewart and Donna Reed (a .MP3 file). "Here's your hat. What's your hurry?" --George. "What is it you want, Mary? What do you want? You...you want the moon? Just say the word and I'll throw a lasso around it and pull it down. Hey! That's a pretty good idea! I'll give you the moon, Mary. ... Then you can swallow it, and it'll all dissolve see, and the moonbeams would shoot out of your fingers and your toes and the ends of you hair ... am I talking too much?" --George (a .WAV file). "Why don't you kiss her instead of talking her to death?" --Man on Porch. "Oh! Youth is wasted on the wrong people!" --Man on Porch. "Oh, not just one wish. A whole hatful. Mary, I know what I'm going to do tomorrow, and the next day, and next year, and the year after that. I'm shakin' the dust of this crummy little town off my feet and I'm gonna see the world. Italy, Greece, the Parthenon, the Coliseum. Then, I'm comin' back here to go to college and see what they know. And then I'm gonna build things..." --George. "Every time you hear a bell rings it means some angel's just got his wings." --Clarence (a .WAV file). For Stewart, who had spent World War II in the Army Air Corps as a bomber pilot and squadron commander, IT'S A WONDERFUL LIFE marked his return to acting and his first post-war film. Stewart's Oscar nomination (the actor's third of five) proved he had not lost his touch. George Bailey telling Mary Hatch: "I don't want to get married -- ever -- to anyone! You understand that? I want to do what I want to do."